What’s behind Israel’s pension gender gap? In recent years there has been much public discussion about a variety of issues relating to pensions in Israel, including concern about the performance of pension funds and the implications of an aging population on the pension system. In particular, women’s retirement age is one of the most contentious topics on Israel’s socioeconomic agenda. Israel is one of only nine OECD countries that has a gap between the retirement age of men (67) and women (62) and recent attempts to increase the retirement age for women have thus far been unsuccessful. Those in favor of raising women’s retirement age cite it as a central factor contributing to the gender gap in pension income during retirement. On the other hand, some argue that raising the retirement age will harm women of low socioeconomic status who would find it difficult to continue working until a later age. In a new Taub Center study, Researchers Liora Bowers and Hadas Fuchs analyze pensions from a gender perspective. In Israel, pension income comes primarily from two sources: old-age allowances (provided by the National Insurance Institute) and private occupational pensions (mandatory since 2008). To get a sense of the full picture, the study analyzes both the gaps arising from differences between men and women in the labor market and the gaps arising from the pension system itself. The study aims to assess what factors impact the pension gender gap and what pension income gaps between men and women will look like in the future. While limitations in data availability make it difficult to measure the pension gender gap among today’s retirees in Israel, data for 640,000 people who held a pension fund with Menorah Mivtachim (the largest new pension fund in Israel) in 2017 indicate that there is indeed a gender gap in private pension savings and this gap increases with age. The most significant gap was found among those aged 45-54: men in this age group have 28% higher occupational pension savings than women. When looking across population groups, the study finds generational differences in the gender gap among Arab Israelis (likely due to an increase in employment and higher education rates among young Arab Israeli women) and higher pension balances among Haredi women than Haredi men (due to the fact that Haredi women are employed at higher rates than Haredi men). 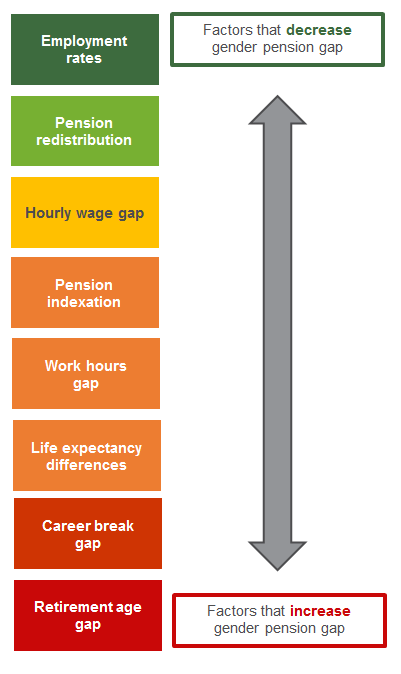 What factors affect the pension gender gap? In addition, while women accrue pension entitlements during paid maternity leave (15 weeks), they do not accrue entitlements if they choose to extend into unpaid leave, as many do, or during other career breaks for childcare. These factors affect differences in the extent of savings men and women have in their occupational pension funds. In addition, there are gender differences in how the sum of the allowance is calculated. Israel is among only four OECD countries that take gender into account when calculating the monthly sum to be paid to each insured individual in the fund, a practice that is not legal in many other countries. Women’s lower retirement age – the factor that has received the most public attention in Israel – actually affects the pension gender gap in both directions. On the one hand, the difference in working years due to the gap in retirement age reduces women’s occupational pension savings. On the other hand, because of the differences in retirement age, women may take advantage of the ability to defer the old-age allowance provided by the National Insurance Institute (NII) until the age of 70 (the absolute retirement age), thereby increasing the value of the benefit. The NII provides an additional 5% for every year of delay so that women who choose to retire at age 70 receive a 25% higher social security benefit from the NII than men who retire at the same age. Looking forward, the researchers use a simulation to estimate future pension gender gaps in Israel. They find that, among married individuals who retire at the age of 67, a man will receive about NIS 2,000 more a month from a pension (occupational and old-age allowance) than a woman: NIS 15,300 compared to NIS 13,300, on average. Among single individuals, the gender gap is expected to be even larger in favor of men: about NIS 3,000. The researchers conclude that gender shapes retirement policies in a uniquely profound way in Israel that has a large effect on pension gaps between men and women. In looking to the future they draw attention both to structural issues within the pension system and to the connection between current labor market trends and future post-retirement income. The Hadassah Foundation has provided generous support for the creation and implementation of this project.